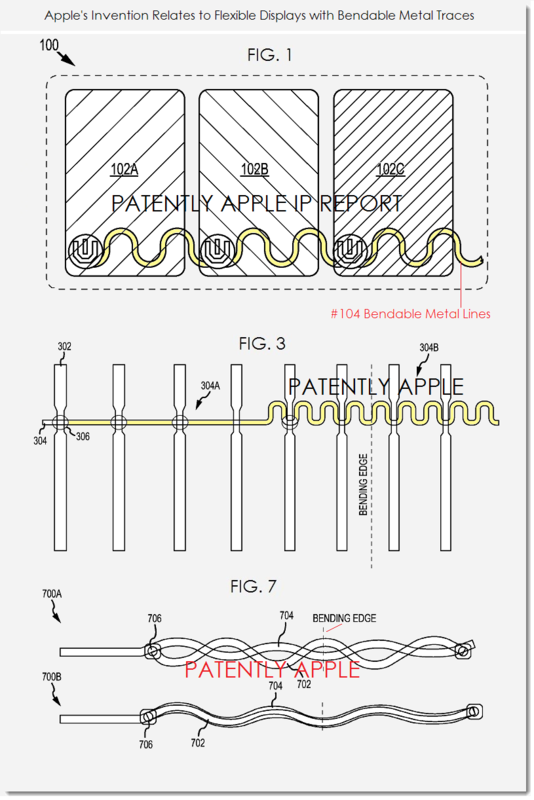 We reviewed Apple's latest patents to see how they might be used in future products. Steve Jobs believed in patenting all of Apple's designs no matter how insignificant. That said, Apple policy on intellectual property is reflected in Jobs' beliefs, even things left on the cutting room floor. On that note, we looked at some of Apple's patents and picked a few we would like to see in the company's next product lineup. Apple developed a somewhat inexpensive display system that utilizes a CPU, operating system (OS), a 3D stereoscopic rendering engine, graphics card and other components to deliver a display that allows viewers to experience 3D without the need for obtrusive headgear or goggles. This will provide a realistic holographic 3D display experience allowing different viewing positions, while enabling personally customized and individual 3D images viewed in a dynamic and changeable environment. The 3D tech provides practical auto-stereoscopic displays (same concept in Nintendo's 3DS) that can accommodate multiple observers, independently and simultaneously. Each observer can experience a uniquely customized auto-stereoscopic image entirely different from what's being viewed simultaneously by others within the same viewing environment. Having this functionality built into future Apple products will introduce a revolutionary method in virtual communication. Interactions between people via FaceTime will look like a scene from Captain America's Winter Soldier. 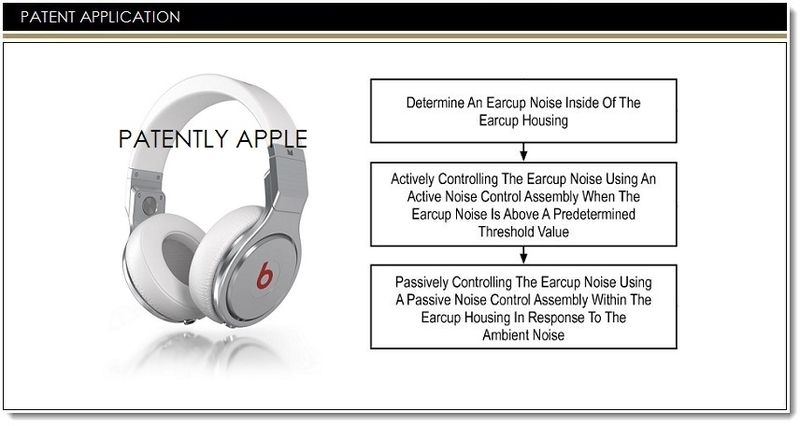 Before acquiring Beats, Apple was already working on over-the-ear headphones, specifically a hybrid adaptive device with active and passive noise control capabilities. Looking to improve on Beats sound technology, audiophiles can look forward to a sound upgrade on future Beats headsets. Apple's adaptive headphones will include a pair of ear-cups that cover the user's ears, which are held by a headband. Headphones are typically classified into two categories based on design; closed-back or open-back. Closed-back ear cups have a sealed back (which encloses the ear completely), while open-back ear-cups provide an ambient environment surrounding the ear cup. Both designs have their own acoustic advantages and disadvantages; closed-back ear cups have good sound isolation because they're sealed off from ambient noise. Closed ear cups, size and suction can be modified to increase sound isolation by automatically or passively mitigating any ambient noise. Closed-back ear-cups make use of an electronic active noise control (ANC) system for additional sound isolation. Apple's adaptive headset will use an ANC system. This is a noise cancellation system that can cancel noise within the ear-cup by emitting an âanti-noise" signal, with the same amplitude and opposite phase to that of the noise so they cancel each other out. It's obvious Apple had a plan in place before acquiring the popular Headphone maker. Its adaptive headset could possibly bring the genre to another level that will keep the current Beats audience happy while attracting others. Earlier this month, Apple revealed its ongoing work on solar cell technology. Apple advanced the display technology to integrate solar cell ambient light sensors that could work with a Mac, iPad, iPhone, iWatch, television or car navigation. The brightness of display images generated by the display is sometimes adjusted based on the amount of ambient light. An example of this is in bright sunlight. The display brightness may be increased, and in a dark room, the display brightness can be decreased. The detected light from the solar cell ambient light sensors may adjust the brightness of the display based on the surrounding light. The light sensor is formed from one or more solar cells, configured as a solar cell ambient light sensor conjoined to the device circuitry. That means no more adjusting the screen brightness when you're in an environment that either has too much or not enough light to make your display viewable. We imagine you would configure the brightness to your specified setting and the sensors will adjust the brightness depending on your environment. Apple is looking to create a phone utilizing flexible displays within computing devices with metal traces that will allow the display to move without breaking or cracking. Using an organic light-emitting layer display (OLED), the device uses a flexible substrate that supports an array of pixels or sub-pixels, and thin film transistors that drive each pixel or sub-pixel. The display flexibility will allow the screen to be rolled into a cylinder or bent into a non-planar shape. Providing such flexibility and portability will allow for certain operations of the display to be enhanced. The base of the device may be formed from any suitable material, such as a polymer (credit card) or polyimide (nylon), along with additional layers present in a sample flexible display. Conventional metal signal lines or traces are straight, and may be subject to cracking or breaking when the flexible display is bent. That is, the bending motion may strain the metal lines, which may result in cracking or breaking. Accordingly, certain embodiments disclosed herein employ serpentine metal traces, as shown in FIG. 1. These serpentine traces may have several properties making them ideal for flexible displays. When the flexible display is bent, rolled or otherwise deformed, the serpentine metal lines may stretch along their circular portions, rather than break. The line labeled "bending edge" illustrates one possible line along which the flexible display may bend. The bending edge is arbitrary and used to illustrate that the display may bend at many other points or along many other lines that are unlabeled. Or the display may bend along a complex curve or permit the folding of a display. Based on the information on this patent, Apple may introduce a display that is as flexible as a table mat or laminated poster. The application of such technology could be endless. Think about materials in your house you can rollup. Your window blinds can become your TV, or your table mat can be used as the daily newspaper, making virtually any bendable material an outlet for information. We'll continue to speculate on the various uses of the patents that Apple filed. The best tool that Apple has in its arsenal is the ability to think differently. How would you imagine these patents used in future Apple products? Share your thoughts in the comments below.